Thomann AG, which specializes in high-quality niche products in large and small sizes, often featuring flaps, is a long-standing partner of Muller Martini. The company has relied on a Bravo T saddle stitcher since 2001, and also used a Baby Pony perfect binder for many years. The Baby Pony was replaced five years ago by a Heidelberg Eurobind 600, which in turn will make way for the Muller Martini Vareo in September. The new perfect binder of the Lucerne-based bookbindery is equipped with a PUR nozzle glue application system at the block spine, a block thickness measuring device, a size calibration station, two scoring wheels, automatic single packer box delivery and a saw dust and glue vapor extraction system. “Our current perfect binder is still going strong,” says Managing Director Thomann, whose parents Irène and Werner Thomann established the family business, which today employs twelve people, in 1969. 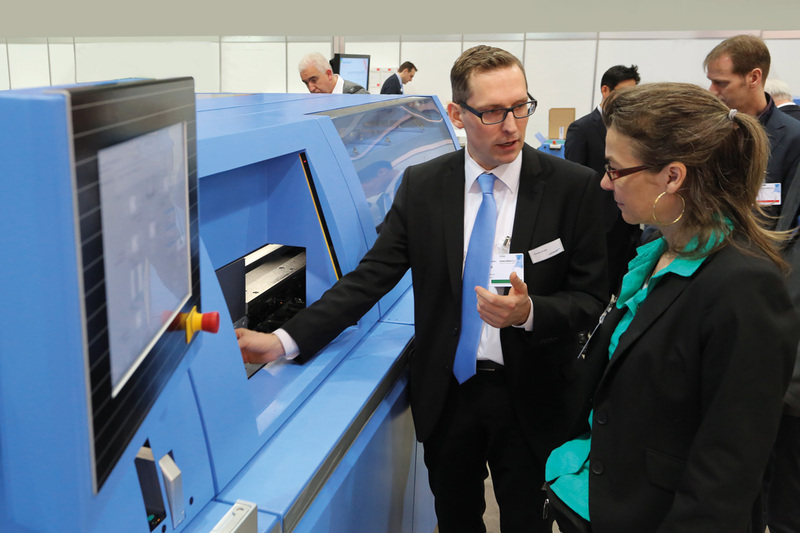 Muller Martini first unveiled the new Vareo perfect binder a few months ago at Hunkeler Innovationdays in Lucerne just a few kilometers from the office of the W. Thomann AG industrial bookbindery. Thomann AG, which binds exclusively for Swiss printing plants, has an increasing number of short runs, not least because more and more signatures are being digitally printed. While the average run size in offset printing for books, catalogs and brochures is around 500 copies, it is 150 for digital printing. Runs of one copy, however, are also increasingly being bound, such as customized company reports with total run sizes of up to 50 copies. “Our perfect binding needs to be top quality even for run sizes of one in order to be successful in this fiercely competitive market,” says Thomann. The Lucerne-based bookbinding professional is impressed not only by the convincing three-clamp system, but also by the servo control of the new Vareo, which had its world premiere in February at Hunkeler Innovationdays in Lucerne and provides maximum flexibility with a mechanical performance of up to 1,350 cycles per hour. With unit drive technology for every clamp, the benefits of continuous and discontinuous drive are combined in a single machine for the very first time. The asynchronous motions of the Vareo mean that every processing step can take place exactly when necessary to achieve the best possible quality of the end product, for example, optimal overtravel speeds or longer cover nipping times, while the overall performance remains the same.